The Ponton Cabriolet Reunion was a huge success. A total of eleven cabriolets took part in the group photo at Autobahn Motors on Saturday, April 19, 2003. There were also numerous photos taken of the individual cars. Ziv Gillat was the official photographer for the Reunion. Contact Ziv Gillat directly at: gillat@yahoo.com for high quality prints of these photos. Any photo can be converted to sepia-tone or black & white upon request, at no extra charge. 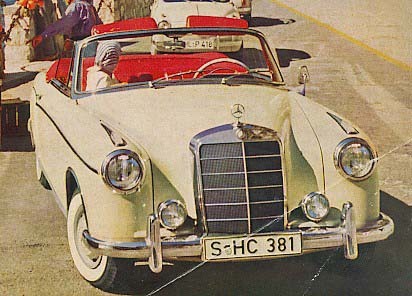 Special Event: "Ponton Cabriolet Reunion"
All Mercedes-Benz lovers are invited, and it is BYOP (Bring Your Own Ponton). We will have a special parking area for all types of Pontons at the lunch venue. Please forward this message to any Bay Area (or traveling) Ponton cabriolet owners. The Bay Area is fortunate to be home to a large number of rare and distinctive models of Mercedes-Benz, among them the 220S and 220SE "Ponton" cabriolets designed and built in the 1950s. 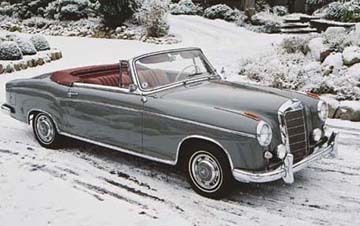 The 220S and 220SE cabriolets are among the last of the hand built Mercedes-Benz passenger vehicles. They were made at the same time as the famous Type 300 "Adenauer" limousines, Type 300SL "Gullwing" coupés and the Type 190SL roadsters, and have been pampered by their owners for nearly 50 years. Only 3,290 220S/SE cabriolets were made from 1956 until 1960, and even fewer survive today. When new, these elegant and special cars were shipped all over the world to find their fate, but many found their way to sunny, prosperous California and we have quite a few beautiful examples right here in the Bay Area. "Ponton" is the name applied to a body style started in 1953 by Mercedes-Benz, and continued through 1962. Pontons are also called "roundies", or "bowlers" in different countries, due to the distinctive body style of the sedans. We plan a reunion for the rare cabriolets from this time period. This may be the largest group of Ponton cabriolets ever assembled since factory days, and we are lucky to have them right here in the Bay Area. The 220S/SE cabriolet may be considered the queen of the Pontons, and while it appears to be another style altogether, it retains almost exactly the same features from the window sills down, but its raked windshield and low slung style make it appear perhaps more Rolls-Royce in nature than Mercedes-Benz. 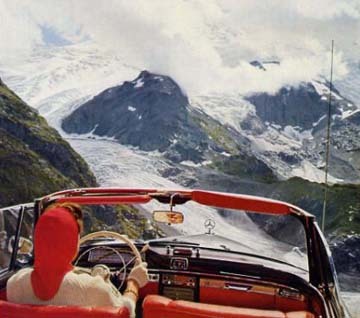 The Ponton cabriolets cost $7,700 in 1958, equivalent to a Cadillac Eldorado Biarritz, which was the most luxurious car America had to offer at the time. The Ponton Cabriolet Reunion will begin at 10:00 a.m. with a photo opportunity at Autobahn Motors. Join the group of cabriolet owners for the photos, and then a convoy for lunch and more photos at the nearby Menlo Circus Club, 190 Park Lane, Atherton. Cost: $50 per car, includes one lunch, a photo of the group, and a goodie bag. $30 each additional person, includes lunch. RSVP by April 1, 2003.